Elegance Wedding Cars are a family run business established in 1988. We pride ourselves on providing a reliable, friendly and professional service. Our wedding car hire service provides the most elegant and luxurious way to travel. If you have any questions we are more than happy to help. 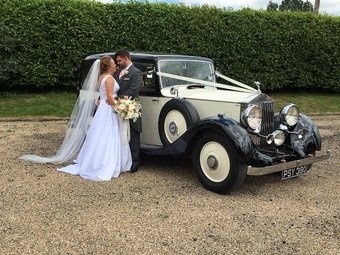 Our range of wedding cars are: Vintage Rolls Royce, Long Wheelbase Silver Cloud lll Rolls Royce, Silver Cloud ll Rolls Royce, Long Wheelbase Silver Wraith II Rolls Royce, Mercedes Limousines, DS420 Daimler Limousines and our X3000 Daimler Limousine. We cover London, Central London, Romford, Dagenham, Waltham Abbey, Epping, Loughton, Chingford, Chigwell and areas inside the M25 near East London.